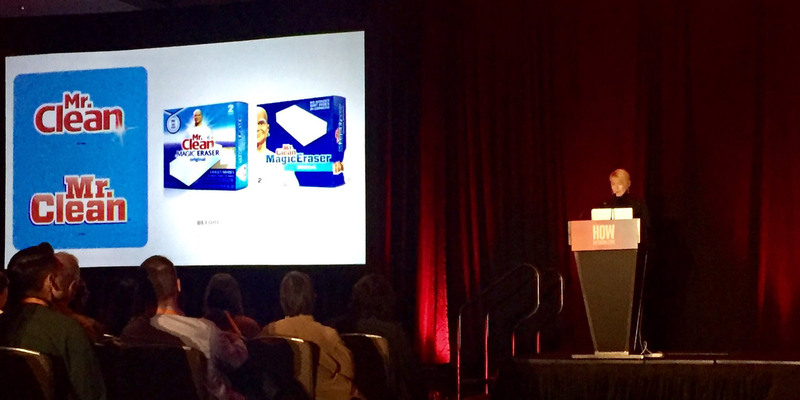 It wasn’t too long ago that I attended the HOW Design Live Conference this year in Chicago. As I was sitting in a session, I was quickly trying to decide what speaker I’d like to hear next. I saw the name, “Chase” and automatically assumed that I would be listening to a Creative Director at JP Morgan Chase talk about financial design which is the industry I work in now. Within minutes after sitting down, I realized I was not going to be listening to a boring banking presentation. Margo Chase kicked off her keynote with her earlier work from the 80’s and 90’s. She worked heavily in the entertainment industry for many well-known artists like Cher, Madonna, Prince, and more. Margo also did many logos for dark shows and movies like Dracula, Buffy the Vampire Slayer, and Charmed. As you can see above, her work definitely has a specific style. Margo talked to us about being dubbed, “The Queen of Goth” for awhile. Personally, I think this is the greatest compliment one could be given. ☺️ Margo explained to the crowd that this was both equally great and terrible. Having a niche is great because you can continuously get a good flow of the same type of work. The biggest pitfall was that she had a really hard time convincing other potential clients that she was able to do anything outside of her gothic work. If you check out the Chase Design Group website, you’ll see that over time her company was able to obtain a wide variety of clients such as Mr. Clean, Coffee Mate, Chinese Laundry, 72/27 Vodka, and so much more. I left Margo Chase’s presentation feeling so inspired. I was amazed at how much of her work I actually already knew of. Margo instantly became one of my favorite design heroes. I found out that Margo passed away a few weeks ago at age 59. She passed away while flying an aerobatic plane, which was her secondary passion in life to graphic design. This was upsetting news to me since I felt like I had just discovered her. Regardless, her work will always live on and I’m so appreciative that I got to hear her speak just a few months ago. If you have a Lynda.com account I urge you to watch this really great documentary below on Margo Chase.